Microsoft is gambling by changing a familiar UI to make Windows 8 compatible with internet "cloud" and relying on mobile gadgets at work and at home. SAN FRANCISCO: Microsoft will release a new version of its flagship Windows operating system, tailored for a world shifting from personal computers to smartphones and tablets, today at 9pm (IST). The software giant gambled by changing long familiar user interface features to makeWindows 8 compatible with trends toward keeping programmes and data in the internet cloud and relying on mobile gadgets at work and at home. "Microsoft has this vision where they want to go; and it is Windows in the cloud," said analyst Michael Cherry of Directions on Microsoft, an independent firm that tracks the Redmond, Washington-based company. "The chasm is very big and Windows 8 is a good first step," he continued. "But, all of these transitions come with a little pain." The arrival of Windows 8 will coincide with the availability of Microsoft Surface tablet computers to challenge Apple's market-ruling iPads and rivals built on Google's Android software. Surface tablets will be among Windows 8-powered devices sold in real-world Microsoft stores that will "pop up" on Friday in the United States and Canada. Microsoft promised that the temporary, holiday-season shops will feature a "curated collection of Microsoft's coolest products." Windows 8 and an accompanying version of Microsoft's free Internet Explorer web browsing program, were designed to optimise touchscreen capabilities. "This is an absolutely critical product," Microsoft co-founder and chairman Bill Gates said in a video interview posted on the company's website. "It takes Windows into the world of touch, low-powered devices, really giving people the best of what we think of as a tablet-type experience and the PC experience," he continued. "It is a big step." Windows 8 will support a wide range of devices, including touch- and stylus-based smartphones and tablet PCs as well as desktop and laptop machines. Versions of the operating system have been tailored for chips used to power various mobile devices. The fate of Surface and other Windows 8 tablets will likely hinge on the availability and pricing of applications, since fun or functional "apps" are what people tend to love about gadgets, according to Cherry. "Frankly, even an iPad out of the box isn't really exciting; it is a platform things can run on," the analyst said. "The real question is how many apps really exploit the Windows 8 platform, and right now the number of apps you can truly get excited about is quite low." Microsoft would "get software developers behind this," Gates added. Apple on Tuesday introduced a fourth-generation iPad and a "mini" version of its hot-selling tablet computer while touting the fact there are more than 275,000 apps tailored for the tablets. Apple also pointed out anew that iPads have been gaining popularity in businesses, long considered Microsoft technology strongholds. Approximately 90 percent of the world's computers run on Windows software but sales of Apple Macintosh machines have outpaced the overall personal computer market for six consecutive years. If mobile device operating systems such as those powering Android and Apple gadgets are factored into the equation, Microsoft's share drops considerably. Windows 8 allows users to store and share personal data among various devices under the "SkyDrive" cloud computing service. Rivals Apple and Google offer such services, which let people store digital data on servers in the internet cloud and access files from devices of their choosing. Windows 8 will be available in 109 languages across 231 markets worldwide. 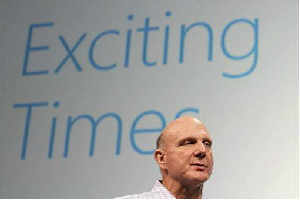 It "is simply the biggest deal for this company in at least 17 years," Microsoft chief Steve Ballmer said at Windows 8 preview event, referring to the time since the launch of the game-changing Windows 95 operating system. "It's the glue; it's the foundation of everything Microsoft is built on." Cherry dismissed worries that Windows 8 changes, such as replacing the Start menu with Tiles on an opening page, will alienate long-time users. "User interfaces should grow, adapt and change," Cherry said. "Let's give people some credit that they will get it." Forrester analyst Frank Gillett considered Windows 8 the most radical change for the operating system since the original Windows replaced Dos software in the early 1990s. It remained to be seen how quickly Windows 8 would be adopted by businesses, which remain cautious after problems with the Vista version of the operating system generations earlier and that follow their own timelines for updating technology. Microsoft reported that pre-sales of Windows 8 have outstripped those of its predecessor by 40 percent. Microsoft will hold a gala party in New York City on Thursday for the midnight launch of Windows 8 and devote a massive marketing budget to promoting the operating system.